The regiment were stationed at Tidworth around the late 1920s, commanded by Lt-Col T A Thornton. 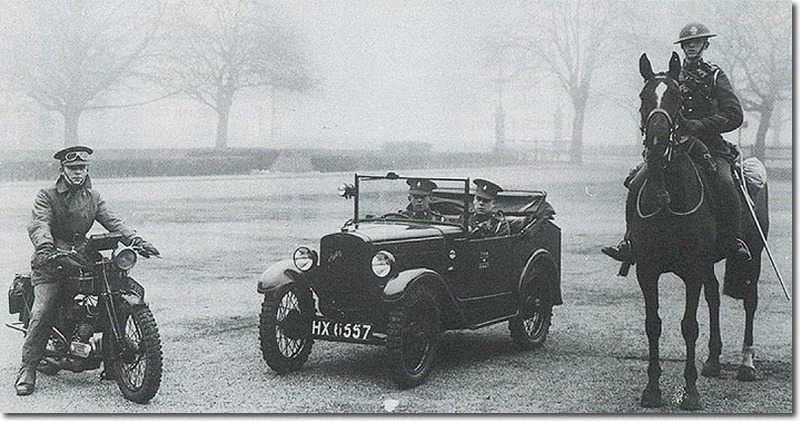 The first vehicles were issued to them in 1927 and around 1928 they were given two Austin Sevens for reconnaissance. This photo was taken to mark the event and to record a stage in the change from horse to vehicle. The mounted trooper is dressed in khaki and armed with a Lee Enfield rifle in a holster on his off side and a sword on the near side. His helmet has the QO badge painted on the front. The Austin 7 has letters and numbers painted on the doors: 7thH, M, 21867. The despatch rider on the motorbike is well covered to cope with wet weather having a raincoat and waterproof leggings.